Even if you’ve never picked up an instrument before, getting started on the ukulele is fun, easy and, if you want, inexpensive. Once you’re acquainted, don’t think you have to stick to playing typical uke songs, though. What Makes a Good Ukulele Song? There’s no rulebook that says only certain songs can be played on a ukulele. In general, what makes a good ukulele song is a distinct and consistent rhythm maintained throughout the song. That being said, anything can sound good on the uke – it’s how you play it that counts. This brings us to the first song we suggest for beginning ukulele players. Israel “IZ” Kamakawiwo’ole’s beautiful melody brings out the joyfulness in the ukulele. Movies like Meet Joe Black, 50 First Dates and Finding Forrester, and popular TV shows like Scrubs and So You Think You Can Dance have helped draw attention to this song in the past. Today, it’s a must-know for ukulele players. This mellow favourite by Jason Mraz has just 4 chords—C, G, Am and F. Get familiar with this chord progression early on in your ukulele endeavour because you will use it to play tons of songs in the future. Shine School of Music teachers Gaspar Muller (ukulele) and Sebastian Pan (acoustic guitar, vocals) play a mash-up of our top 2 songs. This Train single is another example of how pop music has been drawing attention to the ukulele over the past few years. Ben E. King changed the world with “Stand By Me”, which the Library of Congress inducted into the National Recording Registry in early 2015. It has a very distinct rhythm, and to make the song recognisable you really need to imitate that as closely as you can. Remember when learning a new song, take it one step at a time. Break down a song by chords, strum and vocals. Don’t try to do everything at once. 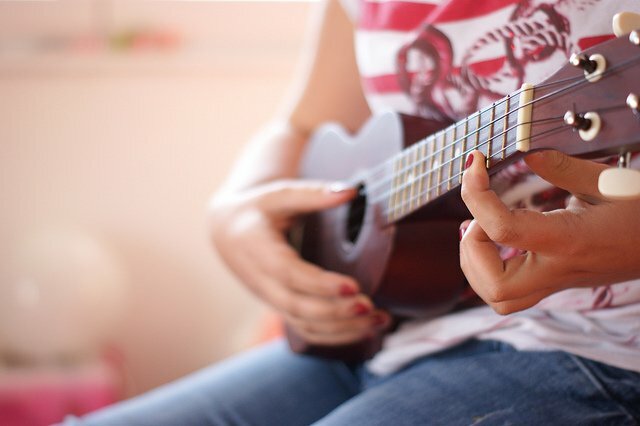 If you want to get a bit more creative with your uke, the second part of our list has some songs you might not have thought to play. Bob Marley & The Wailers’ reggae song is a super easy solo for the uke that will prompt a favourable reaction from any audience. The Animals’ take on “House of the Rising Sun” was arguably the first folk-rock tune, as if they took the ancient ditty from some obscure folk-inspired corner of the United States and connected it to a live wire. Written by Australian singer-songwriter Vance Joy, this song has all the metaphors and pop culture references to partner with the latest ukulele fashion. “Something” was written by George Harrison and released on the Beatles’ 1969 album Abbey Road. The song drew high praise from the other band members, with Lennon declaring it the best song on Abbey Road and McCartney considering it the best song Harrison had ever written. The main theme music for The Godfather, with its intensity and distinction, is not your average ukulele song. Playing it will certainly set you apart from the crowd and earn you some street cred, if nothing else. When Bob Marley & the Wailers’ roots reggae album Kaya came out in 1978, several reviewers said they had gone soft. But the songs on the album simply reflect how Marley was feeling at the time, which was great, and the summery, carefree feel specific to “Is This Love” works well with the uke’s similar sound. “Amélie” is the soundtrack to the 2001 French film Amélie, set in Paris, about a young woman aspiring to help and improve the lives of those around her. Just like you, as a ukulele player, can add merriment to the lives of those listening around you. Even the heartthrob Ryan Gosling, whose smouldering gaze and perfect torso have recently inspired a plethora of playful memes on social media sites, has taken up the ukulele. In Blue Valentine (2010), Gosling gives an impromptu performance of “You Always Hurt the Ones You Love”, while his onscreen counterpart Michelle Williams dances. This lovely old tune is very well suited for the uke. The most important thing is to start playing. Now! So pick one of our cool ukulele song suggestions or find one of your own, and serenade us. For information on what type of ukulele best suits you and your style, as well as where to buy a uke in Barcelona, click here.